I read MediaShift’s article on Dan Fletcher’s departure from Facebook yesterday and immediately saw (reading between the lines) that Dan, and Facebook, were shifting their focus within the Influence Ecosystem. Dan was moving away from the “Influencer” role in the ecosystem and towards “Originator” (where the emergent stuff happens). Facebook is shifting “back” towards being a platform for advocacy between peers. There isn’t a need for a Managing Editor, thus Dan is moving on. The article implies he’s moving to where stories are heading…longer form content anchored to passions and deeper interests. What does this mean? From a Futurist standpoint, this is an early indicator of a shift taking place. There is a burgeoning start-up movement in the “Originator” point in the ecosystem as it’s mostly the final frontier in the current social communications behavior (until it all shifts again). The shareable foresight is that attention is shifting towards the Originators. This is an early indicator, but if you’re planning ahead, I’d recommend strategizing on how you, your team, and your organization can adapt to this shift. Simply, the Influence Ecosystem is how original ideas become adopted by Influencers who then share them with their audiences. In the ideal situation, these audiences then become Advocates for the Influencer’s messages and share them with their peers via word-of-mouth. Then, from this word-of-mouth activity, new ideas are sparked, which are relevant to Influencers and the ecosystem keeps on rolling. The illustration below outlines how the ecosystem functions. This next illustration identifies the roles and behaviors of the points in the ecosystem; what is happening at each of these points. 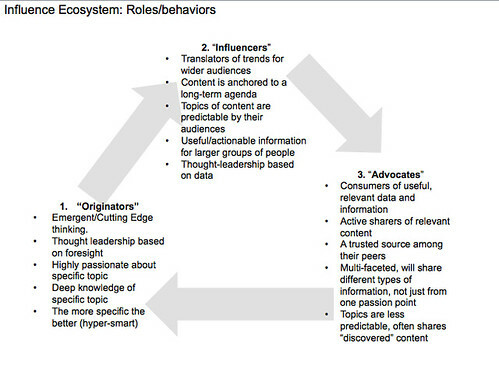 And finally, the illustration below identifies the “who” of these three points within the ecosystem. 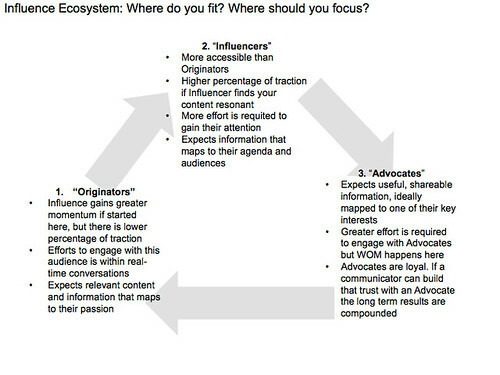 The “who” is meant to help you identify where in the ecosystem you want (or need) to participate. 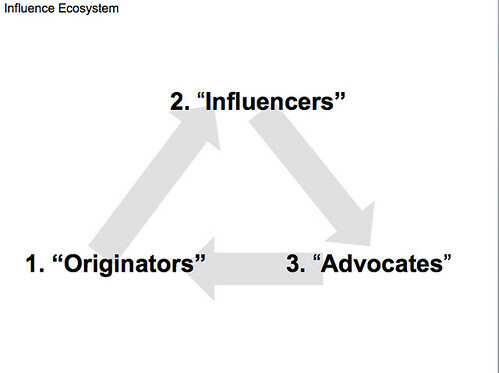 As example, Influencer Management should focus on acting like an Originator in order to get the right content to the Influencers. 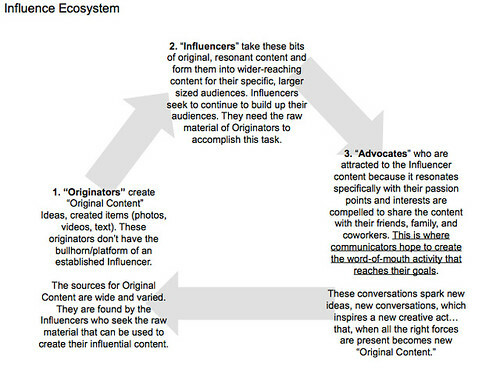 A full Advocacy Program should ensure the “original” content is making it’s way to the Advocates. One short-cut to this success is for brands to become Influencers. This step is taking place through “branded content” platforms such as news centers and company blogs.